This panelÂ does not have the Widget Options. It means that into aÂ slideshow there are no spaces forÂ widget. To confirm the changes click onÂ SAVEÂ button. 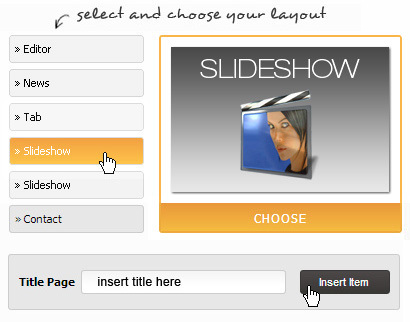 If you click the button on the left of the slide, a panel will appear on the right side.Â It allows you to upload the image (through theÂ BROWSE SERVERÂ button). You can set aÂ link and an ALT toÂ image.Â You can also write aÂ textÂ in the browser if this will be active(ON status). ClickÂ SAVEÂ to confirm the changes. If you want to delete the image, click onÂ DELETEÂ button.